Challenge the bartender to a game or Horses at Powder River Saloon. “You didn’t think we’d be back, did you?” we ask, returning to the Powder River Saloon from a cash run down to Piggie’s Texaco. The room seems to nod in unison. “It was a topic of conversation, yeah,” says a man with longish gray hair on our side of the long U-shaped bar. “It’s about all we had to talk about,” a man with a longish gray beard, on the opposite side of the bar, continues. The regulars are so regular here, they finish each other’s sentences. You could hear a pin drop inside the Powder River Saloon (1903 E. Sherman Ave.), but a third patron assures us things are going to kick off any minute. “We’re waiting for the dancing girls,” he says. The room laughs. There aren’t actually dancing girls. At one point, though, for a few minutes, there was a woman in the place. We ordered before realizing the joint was cash only, hence the trip to Piggie’s. When we returned, the beer that had been poured for us was waiting in the refrigerator. The bartender had kept it cold, just like we were regulars. The plan was one beer a place (Powder River has Bud and Bud Light on tap), but the conversation just kind of flowed, back and forth across the long, narrow, U-shaped bar, and we ended up staying for three before heading to midtown. On the north end of Fourth Avenue, halfway to Pilgrim’s Market, Capone’s (751 N. Fourth St.) is just crushed. Apparently Gonzaga has a big following in North Idaho, too. People crowd three-deep around bistro tables full of beer glasses. The walls are decorated with hundreds of tap handles. The food is good (their Rocket Sauce, like an onion-powdery, runny Thousand Island, is a fry-dipping revelation), and each pass and shot and defensive stop is punctuated by hoots and hollers. The waitress is prompt, and service from the kitchen is quick, despite the crush. We get a couple beers each, a nice little Philly cheesesteak and a pizza and are out the door by halftime. The closer you get to the resort-heart of Coeur d’Alene Fourth and Sherman, roughly in winter, the deader things get. Bar after bar is closed by 9 pm, but at Iron Horse (407 Sherman Ave.), people are falling into the street. One kid is followed closely by a bouncer. 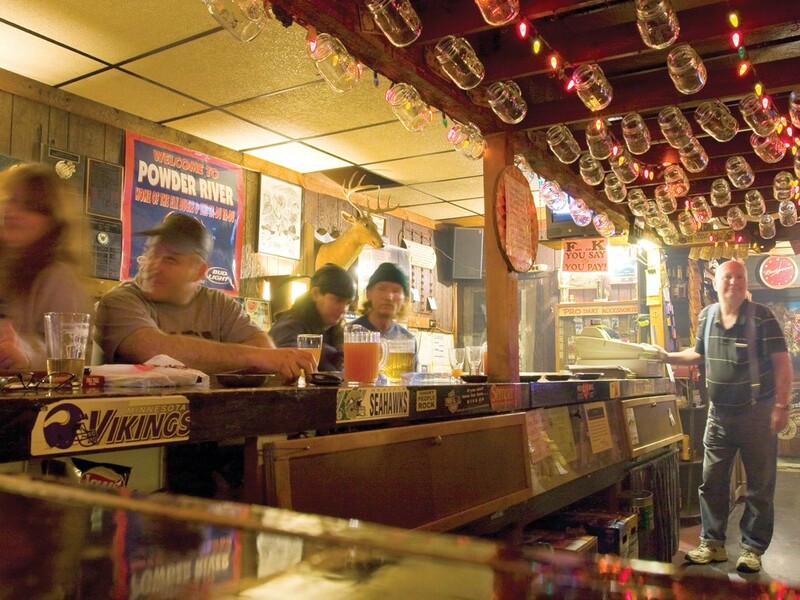 Whenever someone offers you a list of bars to hit in Coeur d’Alene, that list almost always ends with, “oh, and the Iron Horse.” The bar is such an institution that people almost forget to mention it. For better or worse, people describe this as the quintessential Coeur d’Alene bar one that can survive near the resort and still pack out in winter. Festooned with rolling latex club chairs around a large central gas fireplace, the space and decor are quirky. Antique belt fans share design space with a roll-up garage door, fake brick facades and Ansel Adams posters. The bar, like the town, tries really hard to be everything you may want it to be. Except in the winter, of course, when most of what you may want it to be will be closed. The Moose Lounge (401 Sherman Ave.) has a reputation as a staging area for nights out. That bore out on our trip. There was some karaoke happening (country and classic rock well-represented), and some pool playing going on, but mostly people would come in small groups, which, over the course of a beer or two, would swell to squadron-sized, then depart. Across Fourth from the Moose, the Beacon (317 Sherman Ave.) looks on its way to closing for the night, too, but when we shoot the bartender a quizzical expression he says “Come on in! Come in!” A former bank, the place is seriously gorgeous, but it betrays its clientele and location in subtle ways. A massive, square bar with seats on four sides fills the middle of the large, open room, and tables flank the outside. Gorgeous, Tiffany-esque light fixtures illuminate exposed brick, a Captain Morgan statue and a large Crown Royal throne. There is a respectable selection of scotch and an equally large selection of flavored vodkas. The Beacon is a boutique nightclub outfitted in frat casual a catch-all place in a catch-all town and nowhere is that more evident than in the bathroom. The marble around the vanity tells you this is the heart of a resort town. The spent chewing tobacco in the urinals reminds you that this resort town is in Idaho. It goes without saying that Java on Sherman (324 Sherman Ave.) is a CdA landmark. It’s the home of many a summering boomer and more than a few boheme young Internet entrepreneurs. The coffee is great and the vibe is unhurried, because most people in town are either retired, hipster-retired or not into espresso. They’re open relatively late (8 pm nightly), often with live music. A staggering number of current and ex-CdAers (uniformly women), were all like, “hit Splash (115 N. Second St.) for a girlz nite out! Best dancing evar!” Okay, those Zs might not have been direct quotes. It was closed when we went, but we’re going to take their word for it. When his Post Falls location was burned down by a rival pub owner in 2007, Tom Capone acknowledged to the Spokesman-Review that his bar had a tendency to attract Democrats in droves (the arsonist’s bar was a GOP hangout). When we went, our waitress had a rainbow patch sewn to her apron. It’s enough for us to conclude Capone’s (751 N. Fourth St.) is a progressive pub and LBBGTA-friendly (the second B standing for “booze”). Date night with the kiddos? Are you in high school? Working your way through the 12 steps? Triple Play with its water park and bowling alleys and miniature golfing is safe, sane fun that’s open late during the week and later Fridays and Saturdays.